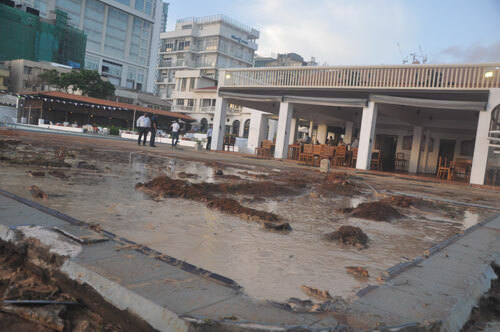 The Colombo Swimming Club (CSC) ignored repeated requests to remove structures from the land acquired from it for road expansion, forcing the Road Development Authority to go to court, RDA Chairman told the Sunday Times. However, CSC President Tony de Livera accused the RDA of using strong arm tactics that saw dozens of foreign tourists fleeing in fear from the exclusive club. “They gave us no warning,” he claimed, saying there were many women and children inside the premises when the RDA turned up with bulldozers and armed police to demolish the structures. RDA Chairman Nihal Sooriyarachchi said the Club management had known since last year that a part of the club premises would be demolished for the Marine Drive expansion up to Galle Face. The RDA had also informed the US Embassy and Grand Hyatt Colombo that some sections of their properties would be taken over. “Negotiations with the management of Grand Hyatt were similarly successful. The CSC, however, continually tried to delay giving up their property for road expansion,” Mr Sooriyarachchi alleged. “While US Embassy officials visited the RDA on numerous occasions to discuss their issue, the CSC management did not come even once,” he said. The structures at the club were due to be demolished last November. But the club appealed to the RDA and the Sri Lanka Land Reclamation and Development Corporation (SLLRDC) requesting time till February as foreign tourists tourists had booked their rooms, Mr Sooriyarachchi claimed, adding that the club had offered to remove the structures itself..
After the RDA demolished the pool area on Friday, guests staying in some 20 rooms close to the pool left within hours. Others are also leaving, he added. “Who is going to compensate us for loss of business?” he asked. Mr de Livera claimed that the club, as an entity, was all but finished, pointing out that the club’s swimming pool was no longer there. “We may as well rename it the Colombo Seaside Club,” he said wryly.